The Alpha Standard™ is our commitment to you that Alpha Technical Services will provide the Best-in-Class quality of service. By adhering to standard practices, our services team will consistently meet and exceed your expectations, providing you with peace of mind and allowing you to focus on your other pressing priorities. 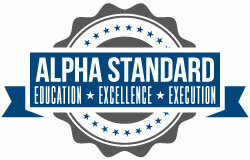 The Alpha Standard is an extension of our corporate goal of being Your Power Solutions Partner.